On Wednesday, the Metro Airport thermometers topped out at 90 degrees for the first time since October 14, 2017. This tied a record high for the date previously set in 2011. Humidity also returned on Wednesday and will hang around through the end of the week. Part of the weekend will have to contend with rain and thunderstorms. Today and Tonight: Thursday will be warm and humid again with highs climbing into the upper 80s, and 90 degrees is not out of the question in some neighborhoods. Partly sunny skies are not likely to yield any showers. Those same southeast winds of 5-10mph will continue as well. Overnight temperatures will drop into the upper 60s, but no lower. Up Next: Highs may be just a degree or two cooler on Friday thanks to increased cloud cover. As the pattern begins to transition due to an approaching cold front, an isolated shower or thunderstorm is possible as well. 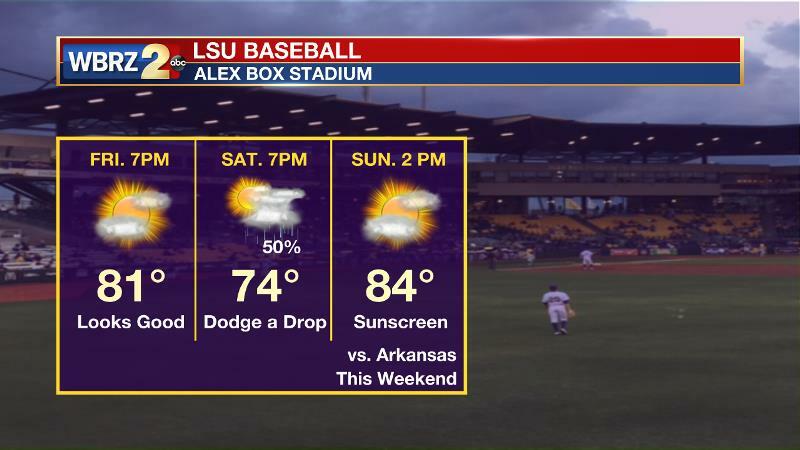 The much better chance for rain will come on Saturday as that cold front moves across southeast Louisiana and southwest Mississippi. In some adjustments to the forecast, activity looks more scattered and less widespread than previously thought. Therefore, a washout is not expected. The cold front should move south and east of the area on Sunday allowing for a drier second half of the weekend. 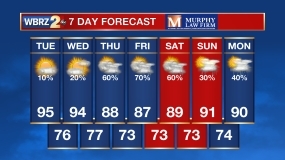 Temperatures will only drop by two to four degrees behind the front, but humidity should be reduced through early next week. An upper level ridge and surface high pressure system in the Southeast will maintain sinking air aloft and southeasterly surface winds. The combination will lead to low chances and increased humidity through Thursday. The ridge will begin to break down on Friday as a shortwave trough approaches from the northwest. Due to this, the atmosphere will be a bit more unstable and a few showers and thunderstorms could develop as a result. The trough will be opening and becoming positively tilted as it approaches so the attendant cold front may be slow to cross the area. With several days of moisture building into the atmosphere, the resulting uplift from the boundary will be substantive to force showers and thunderstorms to develop. However, due to the orientation of the trough and front, dynamic support will be lacking and severe weather is not anticipated. Rainfall amounts look manageable as well with less than a half of an inch across the area. Actually, the EMCWF has backed off precipitation quite a bit over the last few runs suggesting more of a scattered showers type of scenario than a period of rain—which would actually be better news for outdoor plans. This is agreed on by the GEM and NAM models making the GFS appear too aggressive and providing confidence to say the day does not look like a total washout. Both models suggest the trough pushes east on Sunday, taking the front and showers with it.